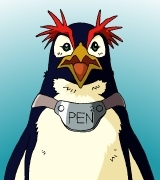 Episode 2: "Unfamiliar Ceiling/The Beast" Episode 2: "Unfamiliar Ceiling/The Beast"
Pen Pen is a unique breed of "warm springs penguin" which Misato Katsuragi keeps in her apartment. The penguin seems to have extraordinary intelligence. It can even read. Pen Pen lives in a specially designed refrigerator, where it has a bed, a lamp... in other words, all the comforts of home.